Shahrukh Khan is busy with every other thing besides bollywood movie. He is getting ready for second innings on Star Plus with Paanchvi Pass show. Besides this, cricket is also in full swing. He is busy promoting his IPL cricket team ‘Kolkata Knight Riders’. He is posing for the team in cricket attire with cool jeans and flaming cricket helmet. “…All the kings men – you mess with one and you mess with the team” is the tagline to lure one and all. 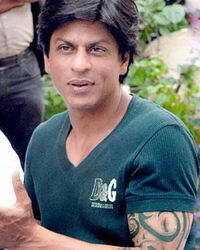 SRK was even spotted with tattoo (hopefully a temporary one) while promoting his IPL team. Here is SRK pose and tattoo stuff for IPL.